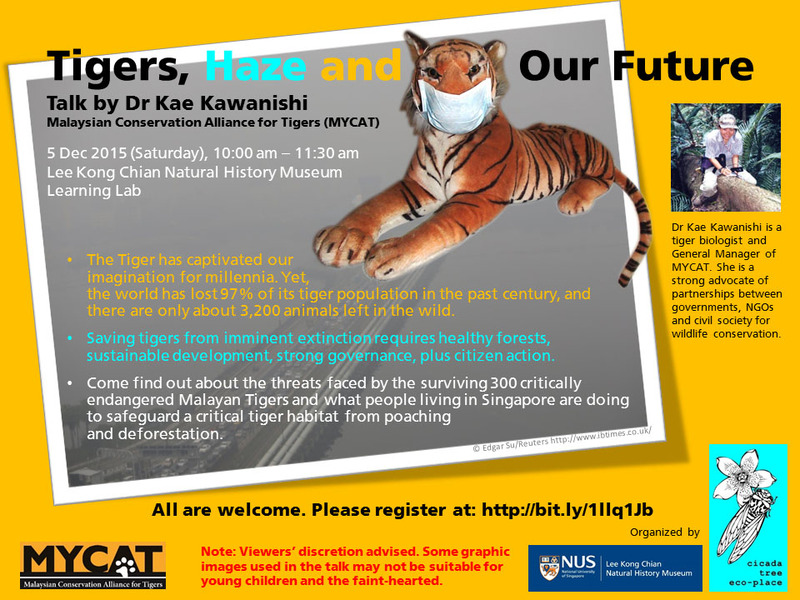 Dr Kae Kawanishi, a tiger biologist from MYCAT, will be giving a talk about tiger conservation at the Lee Kong Chian Natural History Museum’s Learning Lab on Saturday 5 Dec 2015. The Tiger has captivated our imagination for millennia. Yet, the world has lost 97% of its tiger population in the past century, and there are only about 3,200 animals left in the wild. Saving tigers from imminent extinction requires healthy forests, sustainable development, strong governance, plus citizen action. Come find out about the threats faced by the surviving 300 critically endangered Malayan Tigers and what people living in Singapore are doing to safeguard a critical tiger habitat from poaching and deforestation.